Spoiler alert! Excellent food, classic décor and warm ambience make Steakhouse 55 an un-regrettable choice for a wonderful breakfast! Steakhouse 55 is a fine dining restaurant located in the Disneyland hotel next to Goofy’s Kitchen. It provides table service for breakfast and dinner. Also, Steakhouse 55 serves classic afternoon tea on select days (Fri, Sat, Sun). If you’re not a hotel guest and are driving for your reservation, self-parking can be validated for up to 3 hours when dining at Steakhouse 55 (or Goofy’s Kitchen). Advanced Dining Reservation are highly recommended, however, in our case the restaurant was virtually empty except for a couple of other tables when we arrived for breakfast. My wife and I, along with our 2 kids, arrived at our scheduled 8am reservation time and were seated promptly by a friendly cast member. Right away our server greeted us and took our drink orders. 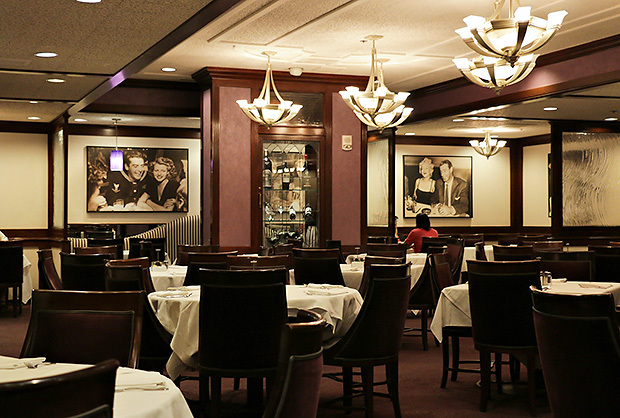 We took in the ambiance and just loved the classic, 1950s Hollywood-style setting. The art on the wall was fun with pictures of celebrities such as Joe DiMaggio and Marilyn Monroe. I think you can tell a lot about a restaurant by the quality of the coffee served. 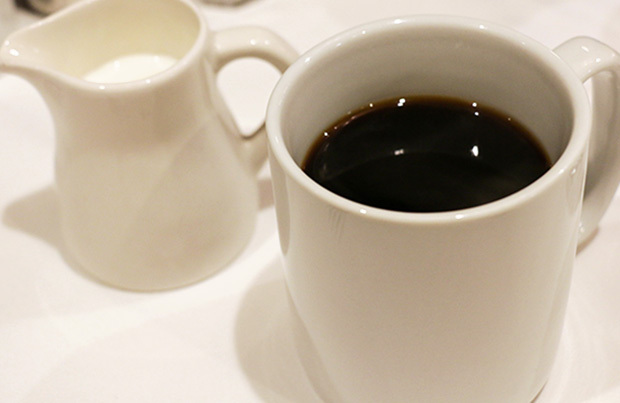 Even at restaurants where the food is pretty good, the coffee is all too often disappointingly light, lacking in flavor and has that not so fresh taste. I personally think it’s not seen as all that important and overlooked at many restaurants. I was very happy that was not the case here. When a restaurant pays attention to that small detail of making a super fresh, rich and full bodied cup of coffee you can raise your expectations a little bit. So I was very pleased when the coffee served here was really good! 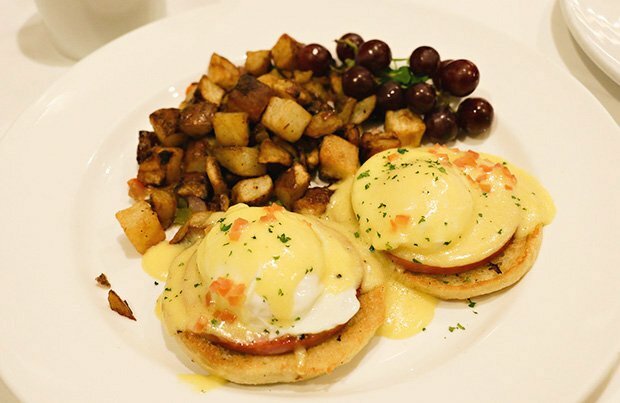 Each of the items we ordered were all outstanding: eggs benedict served with breakfast potatoes, buttermilk stack served with warm berries and syrup, and finally, the two times four which was 2 french toast, 2 eggs, 2 bacon and 2 sausage served with potatoes. The eggs benedict were very good. Eggs benny is a typical breakfast order for me and these were as good or better then any of the ones I’ve had elsewhere. You could tell the hollandaise was house made, it was rich, buttery and delicious! 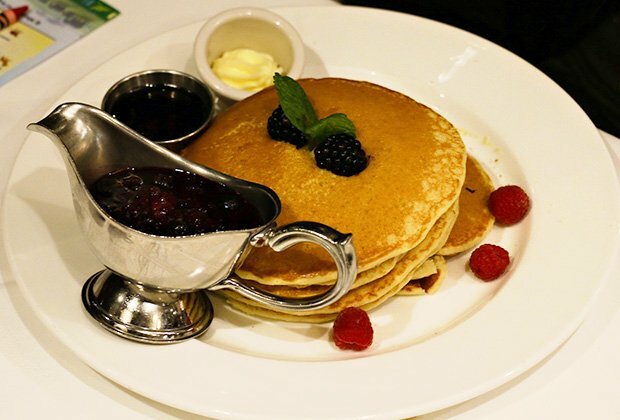 I had a few bites of the pancakes and I thought they were exceptional, very light and fluffy. Especially compared to some of the other dining options (cough cough… Goofy’s Kitchen) where the pancakes were dense and flat tasting. The warm berries were quite yummy as well (I thought they’d be great served over ice cream!) However, for my personal preference I’m more of a butter and maple syrup guy when it comes to pancakes. The French toast was good – the toast was nice and thick then dusted with powdered sugar. It’s so hard to go wrong with bacon and sausage – both were cooked nicely and very tasty. Eggs were cooked exactly to my wife’s order – scrambled well done. 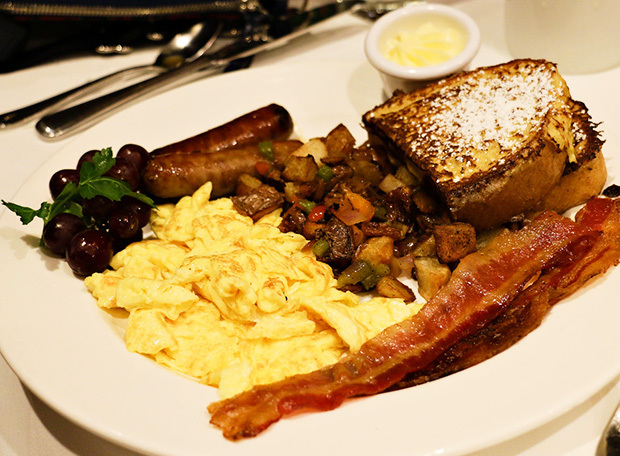 Overall, we enjoyed breakfast at Steakhouse 55 very much. In fact, I think this was quite possibly the best tasting breakfast we’ve had anywhere at the Disneyland resort! 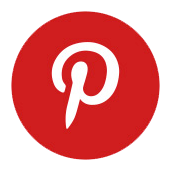 The service was fine, our server did a good job and food came out in good time. Everything was hot and there wasn’t anything that had to be fixed or sent back (always a good thing!). It was a great overall dining experience. One thing I really appreciated and can’t be overstated was the quiet ambiance. I think it’s so nice to get a break from the park during your stay and enjoy one of the nicer table service restaurants. And the price wasn’t bad at all. I thought it was well worth the cost especially for the quality. What we ordered ranged from $12-$16 per item. So for California prices at a fine dining restaurant it’s not at all unreasonable. And the 3 items we ordered for the table turned out to be plenty of food for the four of us – 2 adults and 2 kids (ages 9 and 11). 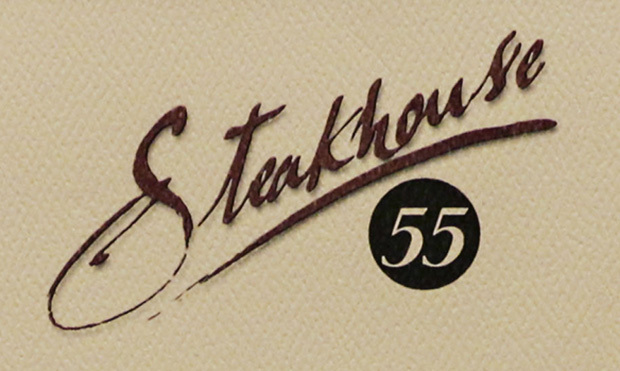 We can’t wait to go back and try another meal at Steakhouse 55!